Adam Tate is a native of southern New Jersey and has lived in Bergen County for the last 17 years. He brings 12 years of construction and home remodeling experience to the home inspection profession. He has also been a member of the carpenters union and is a New York State licensed realtor and landlord. He is passionate about environmental conservation and serves on the Environmental Commission for the town of Hillsdale, NJ, and the Sustainable Jersey roundtable. His experience and his meticulous attention to detail make Adam an ideal member of THIS team. Adam is a U.S. Army veteran who was deployed to the Gulf War in the 1990’s as part of Operation Desert Storm, and he remains active in the American Legion Post 162 in Hillsdale, NJ. We are grateful for Adam’s service to the country, and to the clients of Total Home Inspection Services! is Nigel Turner, Neal Lewis, Mark Bragin, Tim Nadzan, Greg Norton, Adam Tate and Jason Donkersloot. We service all of Northern and Central New Jersey, including Bergen, Passaic, Hudson, Morris, Essex, Somerset, Union, Middlesex and Sussex counties. Collectively, we have over 60 years of experience performing home inspections. 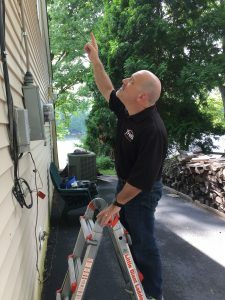 We give you the best, most thorough, in-depth home inspection in New Jersey. Our loyalty is to you, our client, and we want to ensure that you know everything possible about your home, so that you are comfortable about your decision to purchase.